Guess the most versatile pair of shoes every man and woman must have place for in their wardrobe? Of course, B-R-O-G-U-E-S!Who says Brogues are just for men? Hell No! Just hand in a pair of brogue shoes to women, and they will know how to style and carry them off with equal grace. Whether it is for a cocktail party, event launch, brunch, office meeting or a date night- your feet know where to slip in! 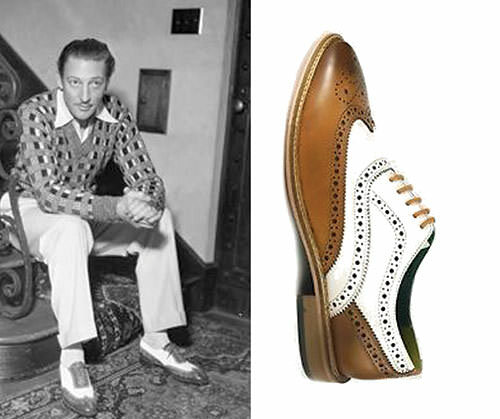 Talking a little about the history of the wardrobe staple, Brogue shoes, which are shoes with perforations, that is, holes punched into the leather in a particular pattern, were originated in the 19th century. Initially, designed for Irish men who would walk to work on muddy and gunky platforms, hence these openings allowed the water to drain out. The above image shows the brown brogues and tan brogues that were worn earlier in the 20th century. How to style Brogues for men and women, formally and casually? These sleek formal shoes are undoubtedly an essential style statement,which are nowadays found in not only formal wear but are also capturing the casual wear segment, widening it’s utility and compatibility. The classic style of brogues can be found in various forms today, for example, loafers, oxfords, brogue boots or derbys.. you name it and it’s there in the same type! There are endless possibilities to style these universal brogues. For a smart formal wear look for men, pair up the artistic shoe with a three piece suit whereas for a more casual and chilled out look, carry them off with a pair of dark denims and knits. For women, on the other hand, team up the chic brogues with a formal skirt and shirt for a special event or office look, or just slip them on with a pair of cool neon shorts and an edgy shirt! You can explore a lot many options by simply using the evergreen ‘mix and match’ technique that works well for a peppy look. Hats off Accessories is a footwear and accessories brand that deals in handcrafted shoes in genuine leather. Available in vast varieties, shop the timeless classics from Hats Off Accessories website today itself. They have a range of handcrafted leather brogues for both, men and women- brown brogues, tan brogues, black brogues, blue brogues, among many others like loafers, oxfords, derbys, and ballerinas. Also available on Jabong, Myntra, Ajio, Amazon, Snapdeal, Flipkart and Paytm.